Home | Resources | FAQs | How Much Ventilation Is Needed? 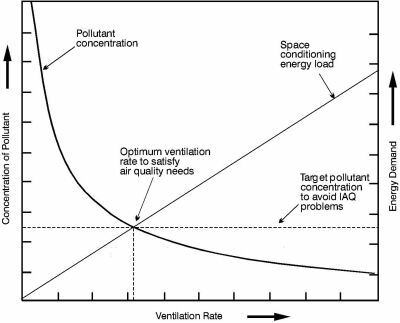 The quantity of ventilation needed depends on the amount and nature of pollutant present in a space. In practice an enclosed space will contain many different pollutants. If the emission characteristics of each is known, then it is possible to calculate the rate of ventilation needed to prevent each pollutant from exceeding a pre-defined threshold concentration. When identical pollutants are emitted from more than one source, then the ventilation rate must be based on the total emission rate from all sources. To determine the overall ventilation need, it is useful to identify the dominant pollutant. This is the pollutant that requires the greatest amount of ventilation for control. Provided sufficient ventilation is achieved to control the dominant pollutant, all the remaining pollutants should remain below their respective threshold concentrations (see Figure 1.2). The minimum acceptable ventilation rate is that which is required to dilute the dominant pollutant to an acceptable concentration. Pollutants from localised sources should be enclosed or extracted at the point of source to avoid contamination of occupied spaces. It is useful to classify pollutants in terms of unavoidable and avoidable sources. Unavoidable sources are associated with metabolism and the essential activities of occupants. On the other hand, avoidable sources are associated with excessive emissions from materials and poorly designed appliances. If the dominant need for ventilation is from an avoidable source, then the reduction or elimination of the pollutant source will provide the most effective and energy efficient method of air quality control. Unfortunately, acceptable safety and comfort concentrations of many pollutants are presently unknown. There is, therefore, currently much debate on how to address the ventilation requirements for such pollutants. On the other hand, recommended safe concentrations are available for several of the most common pollutants. Provided these known pollutants represent the dominant need for ventilation and emissions from avoidable sources are minimised, then any risk to health and comfort can be avoided. Minimum ventilation rate requirements are available in technical note 55 "A review of international ventilation, airtightness, thermal insulation and indoor air quality criteria"